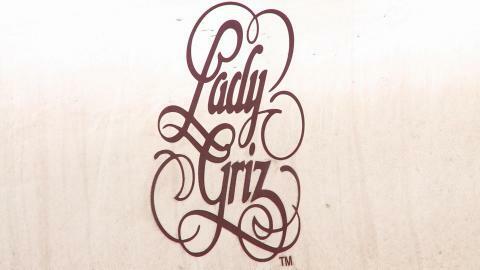 One loyal Lady Griz fan has a front row seat at every game. UM News reporter Katie Mansfield and photographer Khushnuda Shukurova found how William Potter has enjoyed every single home game for the last 40 years. 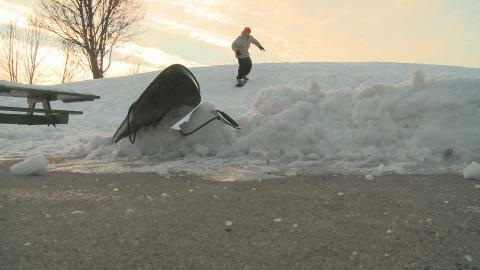 Some UM Students are trying a cool winter hobby called thrashing! Reporter Emily Adamson found how the snow and ice can make thrashing more about falling than flying. 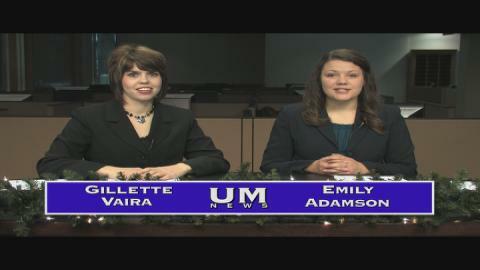 On our last edition of UM News, we take a look at how some students are picking up a new winter sport called "thrashing". Also, we find out how some low-income students at a grade school are getting some help for the winter. 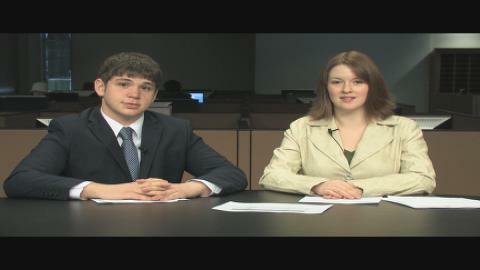 This show was anchored by Gillette Vaira and Emily Adamson. 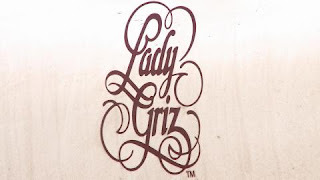 It was produced by Chenelle Smith and directed by Drew Stanley. Happy Holidays! 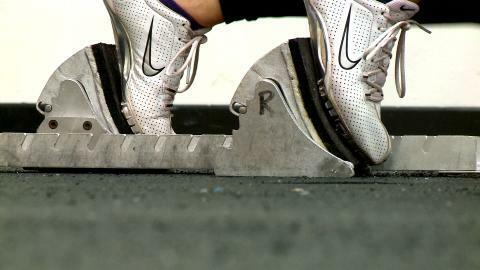 More than eighty athletes make up the UM track and field team. Last week the team kicked off their indoor season which runs until February. Reporter Shaun Rainey found out how an individual sport is all about the team. 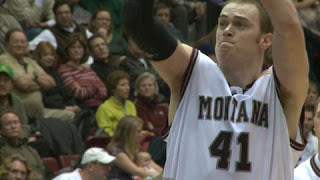 UM senior Brian Qvale says he never takes a day for granted as a Grizzly basketball player. Reporter Vince Bagby and photographer Alison Kilts got a glimpse of a day in the life of this star athlete. 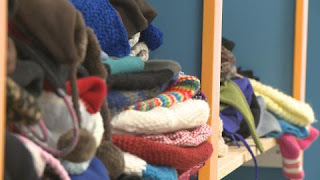 Montana had about a 14 percent poverty rate in 2008, rolling in as the 17th highest in the U.S. Reporter, Gillette Vaira, and photographer, Sheya Rivard, discovered how UM social work students are filling a closet at DeSmet Public School in Missoula to help kids who might not otherwise afford warm clothes this winter. Contact the school at 406.549.4994 to find out how to donate to the closet. On this last edition of Maroon's UM News, we look at how crew's on campus are dealing with the arrival of winter weather. Also we take a look at different challenges that students face, from food intolerance's to sensory disabilities. 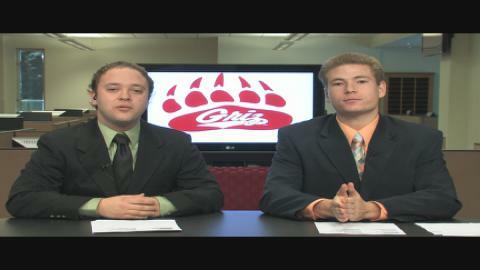 This show was anchored by Jake Stevenson, and Kaelyn Kelly. It was produced by Amy Quinlivan and Keith Hensley directed. 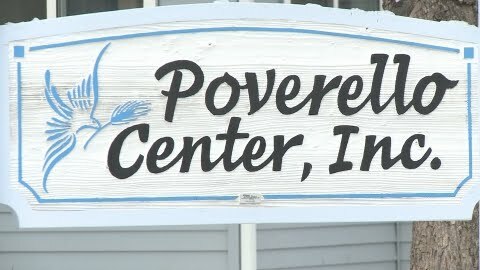 The number of homeless people seeking shelter at Missoula's Poverello Center doubles over the winter months. Reporter Jake Stevenson and photographer Cody Johnson found out how the shelter is helping its residents survive this brutally cold winter. There are over 50 acres of land on the UM campus, and this winter has covered the entire campus with heavy snowfalls. 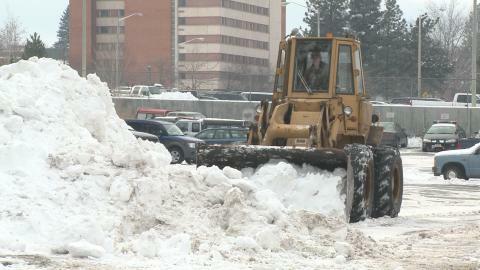 This much snow can cause dangerous conditions all around campus and can cost the University thousands of dollars. Reporter Garrett Browne and Photographer Erin Schermele learned more about the crew responsible for clearing the path. Disability Services for Students has four sign language interpreters who assist five students on campus. Reporter Kaelyn Kelly and Photographer Dan LaDue found out how these interpreters bring the language of learning to hearing impaired students. 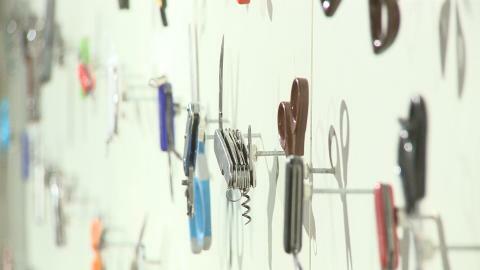 A graduate student in the School of Art at UM's College of Visual and Performing Arts is taking a different approach to terrorism. She explores social and global ramifications of what it's like to live in age of terrorism..
Reporter Kristina Matsalak found out how the artist is trying to bring awareness through her work. The Curry Health Center says Celiac Disease potentially affects 1 in every 133 people in America. Celiac Disease is an intolerance to gluten, a protein found in wheat, rye, and barley. While most college students enjoy pizza and tacos, those with food allergies and intolerances have to be careful of what they eat. Reporter Brittany Wooley and photographer Ava Shearer found out how UM accommodates students with special dietary needs. 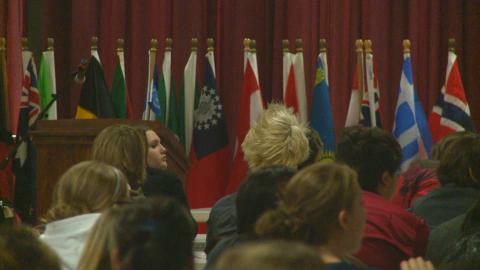 High school students from across the state and Idaho attended the 45th annual Model United Nations conference at the University of Montana. 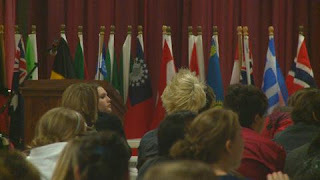 Students learned valuable negotiation skills and wrote resolutions for their assigned countries. Reporter Chenelle Smith caught up with a third year delegate. 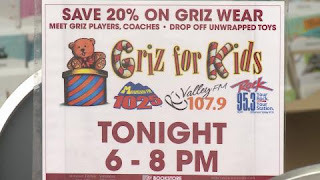 Montana Grizzly Football Team participated in "Griz for Kids" donation program where they signed autographs and accepted toy donations. Reporter Vince Bagby and photographer Khushnuda Shukurova found how community and football team were involved in the event. Local mixed martial arts gym known as the Dog Pound is growing in Missoula. Reporter Katie Mansfield found out how one University of Montana student fighter is punching his way to the top. 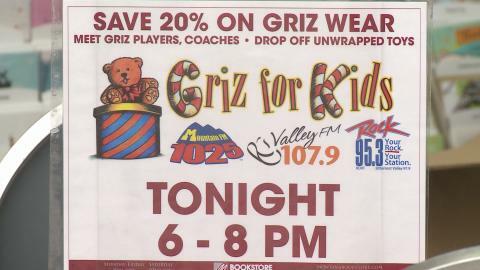 In this edition of UM News, you'll see the Griz Football team, but off the field with Griz for Kids; a toy drive supporting local children. See how the College Republicans are helping troops overseas. Finally you'll see how tough it is to be Monte, UM's mascot, and howMissoula's professional Mixed Martial Arts fighters are making it big. Anchors Vince Bagby and Shaun Rainey took the hot seats in this segment while producer Brad Peers and director Matt Seder led the way. 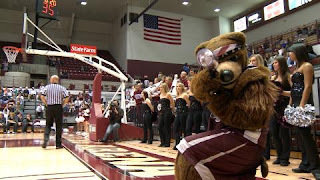 Montana's most beloved grizzly bear Monte aims at the camera with his T-shirt gun. But being Monte isn't all about fun and games. Reporter Shaun Rainey and photographer Drew Stanley found out the hard work that goes in to being one of the most popular mascots in the country.